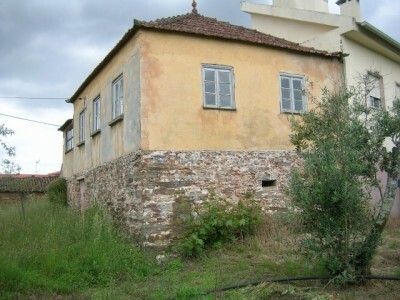 A semi detached stone house which requires renovation and modernisation works for sale near Pedrógão Grande in Central Portugal. The house, which is set over two floors, measures 45 square metres of living accommodation and has land measuring 270 square metres. The house, which has wooden framed windows, has good views. The main entrance to the house is located to the side and is accessed via an exterior stone staircase. There are a number of rooms to the first floor, which has at some point been connected to mains electricity, though is currently not connected. The floors and ceilings of these rooms are wooden and would require some attention. To the ground floor, which is accessed via a large metal door at the front, there are two rooms. These rooms have been used for storage purposes but could be converted to provide more living accommodation. There is a large corner bread oven on the ground floor. The house is set on a plot measuring 270 square metres, which is all relatively flat and has been fenced. The land has been cultivated and there are some trees including olives as well as some grape vines. The property is situated in a small hamlet of Graça in central Portugal. There are neighbouring properties around and a cafe and a mini-market within walking distance of the house. The town of Pedrógão Grande, which has shops, supermarkets, banks, cafes, schools and restaurants is approximately 11 kilometres from the property. The lake of Cabril is only a short drive from the property. Cabril lake, although a reservoir, constructed in 1954, is popular for all kinds of water sports including fishing, swimming, sailing and canoeing. There are a number of ‘River’ beaches within easy reach. The property is easy to locate and has good access to the IC8 dual carriageway. The closest airport to the property is located at Porto, which is approximately two hours drive. Porto airport is located north of the city and is serviced by several low cost airlines, which operate regular flights into and out of the United Kingdom. Lisbon airport, which is approximately 189 kilometres away, takes around two and a half hours’ by car.